On May 8, 2015, Parachute Literary Arts debuted POEM-a-RAMA on the landmark Wonder Wheel in Coney Island. POEM-a-RAMA is the first literary event to be held on the Wonder Wheel. Inspired by site-specific theatre, Parachute's Director, poet, Amanda Deutch curated a poetry reading on Coney Island's landmark Wonder Wheel. Sixteen New York City writers rode the Wonder Wheel, reading poetry to people who rode in cars with them. Actor Tim Cusack brought the words of Walt Whitman to life (Coney Island was Whitman's favorite location) by reciting Walt Whitman on the iconic ride dressed as Walt Whitman. Three teenage students, Maya Sanders, Gavrielle McIntosh and Imani Nooks, from Parachute Literary Arts longest running after-school poetry workshop read their own poetry under the Wonder Wheel alongside esteemed Brooklyn poets: Patricia Spears Jones and Lynn Melnick. Emerging and established New York City poets read in the white (stationary) cars of the Wonder Wheel for passengers creating miniature salons of wonder in each car. There was a Poetry Making Station with vintage typewriters. 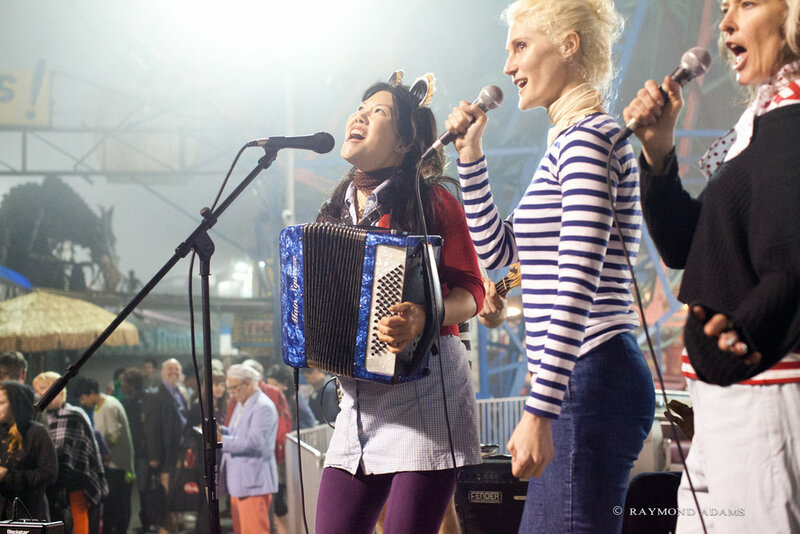 Brooklyn-based band, Soozee Hwang and the Relastics sang songs about books (including by Kurt Vonnegut) as a thick fog rolled into Deno's Wonder Wheel Park. Teen poets reciting from Parachute's workshops at POEM-a-RAMA were: Maya Sanders, Gavrielle McIntosh and Imani Nooks. The poets reading in cars of the Wonder Wheel were: Amber Atiya, Kurt Boone, Marina Blitshtein, Michael Broder, Brenda Coultas, Tim Cusack (Walt Whitman), Ian Dreiblatt, Jen Fitzgerald, Matthea Harvey, Brenda Iijima, Lucy Ives, Tyehimba Jess, Julie Ezelle Patton, Wanda Phipps, and Edwin Torres. On the ground poets and Parachute Poetry workshop leaders, Lynn Melnick and Patricia Spears Jones read under the phosphorescent illumination of the Wonder Wheel. POEM-a-RAMA is proudly sponsored by: Deno's Wonder Wheel Park, Brooklyn Roasting Company, Coney Island Brewing Company, Dos Toros Taqueria, and Steve's Authentic Key Lime Pies. Parachute Literary Arts Poem-a-Rama is supported by the New York State Council on the Arts with the support of Governor Andrew Cuomo and the New York State Legislature.